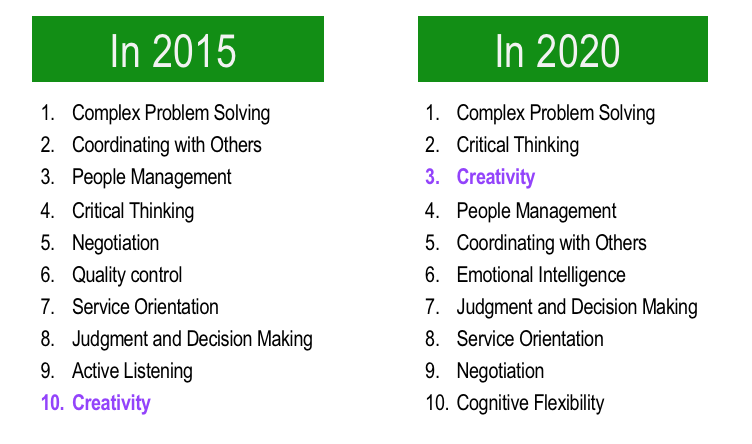 It’s hard to think about the future of management education without thinking about the future of work. In case you haven’t noticed, there is no shortage of predictions about the future of work. Any reputable consulting firm has a report out on the future of work, including McKinsey, Bain & Company, BCG, Deloitte, and PwC. Think tanks, media outlets and other organizations also have thoughts on the future of work and how to prepare for the that future, including the World Economic Forum, Fast Company, Strategy+Business, the OECD, The European Political Strategy Centre, and Nature. MITx even has a course about it. What’s a Business School to Do? Many of these skills can and should be taught in management programs – and some schools are already doing a good job in these areas. But more can be done. As Tom Wujec mentions in a TED talk on a design challenge he runs with many different groups, “. . . among the worst [performing teams] are recent graduates of business school. . .And the reason is that business students are trained to find the single right plan. . . and then they execute on it.” He goes on to note that among the best teams are those that are recent graduates of kindergarten. Business schools have faced a fair amount of criticism in the past, for everything from being responsible for causing the 2008 financial crisis through teaching the wrong things. The realization that business schools need to change isn’t new and, in fact, the indications are well captured in many different articles, books, and reports. Here are three that I find particularly relevant. Refocus on learning as a lifelong endeavor. Average life expectancy is rising, more people are wanting (and often needing) to stay in the workforce until much later in life, and the skills they need for the various careers they’ll have will evolve over their lifespan. Colleges and universities need to think this through and create new programs, pathways, and platforms to reach learners at all stages of life. Understand that the way we create and deliver education through the university is quite likely to change. The higher education market is in the midst of unbundling. While this will create winners and losers in the higher education arena, it may be a good outcome for increasing access to higher education and spur innovation in higher education. Focus more on the human side of management. In his 1996 article, “The Human Side of Management,” Thomas Teal noted that “mediocre management is the norm” and that one reason for this is that “in educating and training managers, we focus too much on technical proficiency and too little on character. . . But we’re still in the Dark Ages when it comes to teaching people how to behave like great managers – somehow instilling in them capacities such as courage and integrity that can’t be taught. Perhaps as a consequence, we’ve developed a tendency to downplay the importance of the human element in managing.” Twenty years later, this still rings true. Poor management demoralizes people and ultimately takes a toll on performance. At a minimum, perhaps we should have everyone read Bob Sutton’s first book, on building a civilized workplace book, and his second one on surviving one that isn’t. Teach our children and students about the importance of ethical behavior (and enact policies that support this and laws that punish bad behavior). It matters and will help us shape a world – of work and otherwise – that we all want to live in.